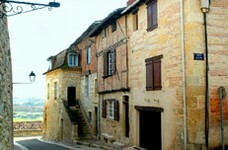 The town of Lectoure lies in the Gers department of south-west France, in a peaceful rural setting. Although the town itself is essentially calm, with its buildings being attractive examples of old Gascon architecture, built in the distinctive pale stone of the region, there is plenty to do. A lively and warm atmosphere pervades the town centre, which offers a good selection of shops, these also being popular with the people who live in the smaller outlying villages. In fact all everyday needs can be met in or close to the town. In addition, a thermal spa was opened in 2003, which now plays an important part in the town's economy. So when you have finished with the shopping, banking and other mundane tasks, you can treat yourself to a spa treatment in the thermal baths… bliss! The town of Lectoure has also been officially designated a town of art and history by the French minister for culture and communication. Art and history towns are always interesting to visit, and frequently host exhibitions such as the photography exhibition held in Lectoure. The town offers some interesting museums, including an archaeological museum and a museum of religious art, and there is also much of historical interest in the town itself. Once an important military town in Gallo-Roman times, Lectoure was a strongly fortified town, and it is possible to find parts of the ramparts still existing today. The region of Gascony was historically a very hospitable region with a proud gastronomic tradition. Lectoure is no exception to this, and in the town today you will find plenty of bars and restaurants offering Gascon hospitality and cuisine at its very best. Local specialities include duck, Foie Gras and, of course, Armagnac. It may not be the best place to be if you are on a strict diet, but if you enjoy excellent French cuisine then Lectoure is superb. Outside the walls of the town itself there are many opportunities for taking part in sporting activities. There is golf and horse-riding, walking, mountain biking and swimming available close by, and also for the more adventurous there is quad biking, karting and even the possibility of a flying lesson in a light aircraft! Even if you have no desire to take the controls yourself, it is a wonderful way to appreciate the glorious countryside which surrounds Lectoure. Reaching Lectoure from the UK is not difficult, thanks to the fact that the town is accessible from no less than five airports. Carcassonne, Toulouse, Bordeaux, Pau and Bergerac are all within reach, although Toulouse is probably the best choice. Toulouse is served by several airlines, including bmi and flybe. The TGV fast train will take you to Toulouse or Agen, and if you are driving you will find the town situated not far from the A62 autoroute. 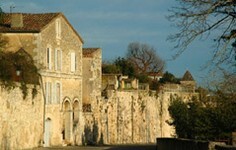 Lectoure is situated in a region where the price of property can be lower than is often found in the south of France. The Gers offers some real property bargains, and some of the most beautiful traditional rural properties in France can be found in or around Lectoure. Many farms and barns can be found here, and tend to have the lovely distinctive pitched roofs and interior timbers typical of old Gascony. Do you know Lectoure better than we do? Do you have photos of Lectoure? The town of Lectoure is found in the south-west of France, in the north of the Gers department. Access: By air: Fly to Toulouse, Bordeaux, Carcassonne, Pau or Bergerac. By rail: Take a TGV to Agen from Paris (30 minutes drive away). By road: Take the A62 autoroute. Economy: The production of Armagnac and thermal tourism are both significant in the economy of Lectoure. Interesting fact: The town's thermal baths which were opened in 2003 are said to be a cure for rheumatism.